In our text messaging, cell phone, TMZ, Facebook and Twitter world, it’s vital that students have the critical skills needed to navigate the various messages they receive. Students no longer just read, they are texting on their phones, listening to music and surfing the web all at the same time. Students’ practices outside of the classroom should be reflected inside the classroom. One way to support students’ multiple literacies can be through the use of comic books and graphic novels. Traditionally, literacy has been thought of as reading and writing of print-based material; but, now multiple literacies have evolved with the emergence of new visual modes of communication. The visual nature of comic books and graphic novels can allow students to connect with complex concepts. To understand the message of a comic book requires the reader to interact with the combination of words and images, rather than relying solely on words or pictures. Comics have unique elements that create meaning, such as panels (the frames that contain the action), dialogue balloons (which reveal the characters’ dialogue), thought bubbles (which reveal a character’s interior thoughts), caption boxes (which help to narrate the story), and gutters (the space between the panels). Comics also illustrate techniques such as point of view, body language, sound effects and the passage of time. It is through the integration of all of the comics’ conventions and techniques that concepts and ideas become explicit for students. I believe that comics can be used in any classroom as a means of promoting students’ multiple and critical literacies. There are many benefits to using graphic literature as a pedagogical approach. Comics can highlight and enhance visual and textual literacy. They can help English Language Learners in decoding information through the integration of words and images. Comics can motivate struggling and reluctant readers as well as challenge more sophisticated and advanced readers. It is also a great vehicle to support a social justice agenda, helping students to become more critically aware of the way in which they interact with the world. Comics can be used in any classroom at any level to support, motivate, engage and challenge students. My practice with comics has led to my own better understanding of how it can support students’ multi literacies. I used a graphic novel version of Shakespeare’s Hamlet with my advanced grade 12 English class to help students understand and interpret the challenging speeches that Hamlet delivers in the play. The graphic version helped to break down the speech into smaller parts within each panel and also included pauses (or comic book gutters) between the sentences of the speech. But it was the visuals that truly supported my students’ understanding of the themes of jealousy, betrayal and mental health at a much deeper level than using the traditional version of the play. The visuals displayed Hamlet’s physical actions, body language and facial expressions which communicated his thoughts and ideas in an explicit manner. The graphic novel inspired class discussions about Hamlet’s state of mind and more current issues of mental health, such as anxiety, depression and suicide. Using graphic novels together with the original text supported my students’ understandings of the play’s themes and characterization. I also implemented a comic book unit in my grade 12 Ontario Secondary School Literacy Course. Students enrolled in this class were unsuccessful at the Ontario Secondary School Literacy Test and are completing their requirements through this course. Generally, my students were struggling and reluctant readers and writers. To encourage and motivate them, I acquired a donated class set of comic books from a local comic book store. As part of their reading unit, students had to predict, infer, clarify and summarize what was happening in the comic books, especially in the gutters. Students demonstrated their inferring, predicting, clarifying, summarizing skills by creating alternate versions of the story using comic book panels, and/or described what happened between the panels in their own words. This helped them to read between the lines and understand the meaning of the text at a deeper level. To my surprise, every student in the class quietly read and most had finished reading their first book and started on their second before the end of the class. In this case, comics were a terrific motivator! My experience with graphic literature also includes student-generated comic books. I have seen firsthand how student engagement and enthusiasm increased when students read or created comic books of their own. After reading George Orwell’s 1984 with one of my advanced grade 11 classes, they responded to the novel by creating their own comic book version of how technology affects our world. One of my disengaged students started coming to class early, became a leader in class discussions, and also was the first to hand in his comic book which he created entirely by hand. His comic book not only looked amazing, it also demonstrated advanced comic book techniques which we had discussed in class. It was through graphic literature that this student became enthusiastic and motivated about course content. Although my experience is specific to English studies at a secondary level, it can be applied to junior and intermediate levels as well. Maus by Art Spiegelman is about a refugee’s story of survival during the Holocaust. The visual and textual nature of this graphic novel would give life to an eyewitness account of historical events that would make a history or social studies class come alive. Persepolis, by Marjane Satrapi, is about a girl growing up during the Islamic Revolution and the Iran-Iraq war. This graphic novel is a great resource for world issues courses or cultural studies as a way to examine and challenge Western and Middle Eastern social, cultural and political ideas as well as to confront issues of violence and terror, to break down preconceived notions and stereotypes of Islam and its people, and to bear witness to the horrific trauma of war. Two Canadians who are making an impact on the graphic literature world are Jeff Lemire and Scott Chantler. Jeff Lemire’s Trillium merges science fiction and history together to tell a story about how we are all connected. The reader is challenged to flip the book into different orientations to fully understand the storyline. 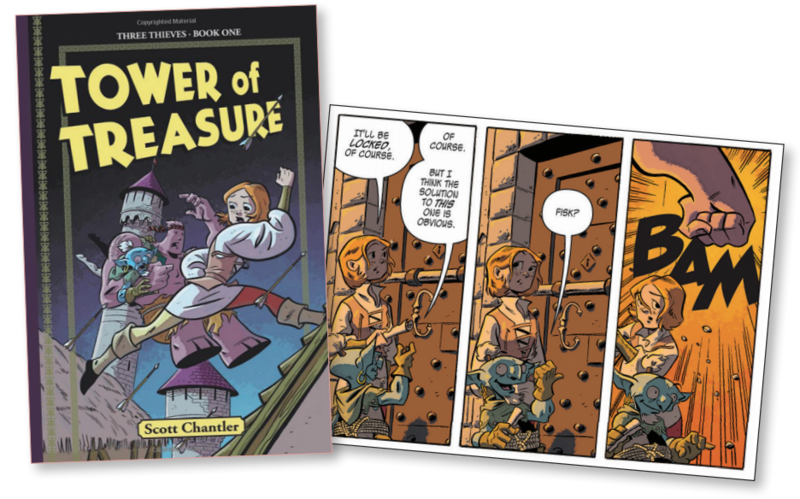 For a younger audience, Scott Chantler’s, Book One: Tower of Treasure from his Three Thieves Series is an action-packed and entertaining read for both boys and girls. Before using comics in your classroom, there are few things to keep in mind. To gain a better understanding of how comics work, I would suggest reading Understanding Comics by Scott McCloud. When choosing a comic book or graphic novel, make sure to assess whether it meets curricular and school expectations by reading the text itself. To help create and implement lesson plans with comics, I would recommend In Graphic Detail: Using Graphic Novels in the Classroom by David Booth and Kathleen Gould-Lundy and Drawing Words and Reading Pictures: Making Comics, Manga, Graphic Novels and Beyond by Jessica Abel and Matt Madden. In Graphic Detail assists teachers in introducing students to the process of reading comics on a practical level with its easy-to-use lesson plans, while Drawing Words and Reading Pictures contains lesson plans with a companion website that helps to explain the process of creating comics (http://dw-wp.com/). There are two great technological resources available to assist students in creating comics, such as Comic Life (http://comiclife.com/) and Bitstrips for School (http://www.bitstripsforschools.com/). 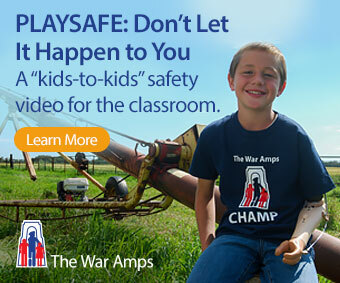 It is imperative that students can critically engage with our visually saturated world. Visual and critical thinking skills are becoming more and more necessary in this visually-based society. Utilizing comics as an instructional approach will support and enhance students’ multiple and critical literacies. Brianne MacLaren-Ross is an English Language Arts and Special Education educator and instructional coach with the Greater Essex County District School Board in Windsor, Ontario. She is currently a doctoral student in the PhD in Educational Studies at the University of Windsor. Her research focuses on using graphic literature in the classroom as a means of promoting multi literacies and critical literacies.